Congratulations to second-year graduate voice student Corie Auger for being named the winner of the 2015 Penn State Graduate Exhibition (Performance Option). Corie performed for the Penn State community on March 20 in Esber Recital Hall, singing "Una voce poco fa" (from Il Barbiere di Siviglia) by Gioacchino Rossini. From Ortonville, Michigan, she is a graduate of Grand Valley State University. She hopes to pursue a career as an opera performer and university voice teacher after graduation. Corie is a voice student of Ted Christopher. The Graduate Exhibition celebrates research in all its aspects as an essential and exciting part of graduate education at Penn State. 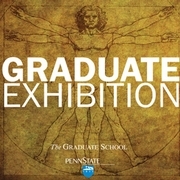 Established in 1986, the Graduate Exhibition places special emphasis on communicating research and creative endeavor to a general audience and offers an unusual opportunity for professional development by challenging graduate students to present their work in clear, comprehensible terms to people outside their fields. The performance option includes graduate student performers from the School of Music. Pianist Anna Siampani, playing "Sonetto 104 del Petrarca, S. 161, No. 5" by Franz Liszt, placed second. Third place winners (tie) were the Penn State Graduate Brass Quintet and Ronald Valbuena and Sri Gopal Diaz, violins.